(For the benefit of non-Irish readers, the word “gunas” in the headline is, I think, an attempt by the sub-editor at multi-lingual wordplay. The word “gúna” (pronounced “goo-nah”) is the Irish word for “dress” or “gown”; the plural in Irish would be “gúnaí”, pronounced “goo-nee”. The sub was plainly going for an aural link between “gown” and “gúna”, and thus between “gowns” and “gúnas” (pronounced, presumably “goo-nahs”). I’m not sure that the attempt at multi-lingual wordplay was all that successful, but never mind). The simplification of judicial court dress is to be welcomed, but I would pause at this point. Court proceedings are serious matters, and some dignity and ceremony – including some formality of regalia on the part of court actors – are entirely appropriate (see Rob McQueen “Of Wigs and Gowns: A Short History of Legal and Judicial Dress in Australia” (1999) 16(1) Law in Context 31; reprinted Federation Press Digital Edition 2008). In many ways, they are symbolic of the respect to which the Courts and their orders are entitled. One of the new gowns’ first outings was when the Supreme Court handed down their judgments in Irish Bank Resolution Corporation Ltd v Quinn Investments Sweden AB, and others  IESC 51 (24 October 2012), a case concerning contempt of court and the failure of three businessmen to respect orders of the courts. In the High Court (2012 IEHC 379 (26 June 2012)), Dunne J had held that the three businessmen – Seán Quinn Snr; his son, Seán Quinn Jr; and Seán Snr’s nephew, Peter Daragh Quinn – were in breach of earlier High Court orders (see Clarke J’s order of 20 July 2011 referred to in para [3.13] of his judgment in  IEHC 356 (13 September 2011)) and were consequently guilty of contempt of court. On 20 July (one year to the day since Clarke J made the orders in respect of which they were held to be in breach), she sentenced Seán Quinn Jr and Peter Daragh Quinn each to determinate sentence of three months as punishment for breaches thus far, and to concurrent indeterminate sentences to coerce compliance; but she gave Seán Quinn Snr a three further months to comply. Peter Daragh Quinn absconded; but Seán Quinn Jr began to serve his sentence, and he appealed against Dunne J’s orders. 95. … A person, who has been found guilty of contempt of court, may be required by an order of a court to purge his contempt. Where, following a finding of contempt, a person refuses to obey the court order, he may be imprisoned by order of the court until he undertakes to obey the order, i.e., purges his contempt. Imprisonment is not the only remedy. In certain types of case, a court has been known to impose a daily or other periodic fine. In the case of a corporation, assets may be sequestered. 111. Regrettably, the procedures followed by the Bank in respect of the appellant, after 26th June fell far short of what is required and should be expected. 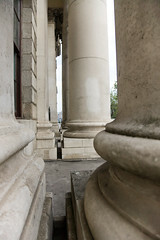 The Bank was entitled to seek appropriate orders flowing from the finding of contempt of court made by Dunne J. on 26th June but not otherwise. In the result, its actions were procedurally and substantively flawed: procedurally, because of absence of notice; substantively because of the assumption that coercive orders could be granted without connection to the finding of contempt. 112. None of this is to say that the Bank does not have strong grounds for pursuing the appellant in respect of all or any of the matters the subject-matter of the coercive orders of 29th June. But the Bank must follow appropriate procedures. It is right and necessary that the Bank take steps to protect the integrity of the orders of the court. That is to pursue the interests of justice, respect for the courts and the rule of law. However, it is equally of the essence of the administration of justice that any person whose imprisonment is to be sought be given clear, adequate and fair notice of the order he is alleged to have infringed and the manner in which he is alleged to have done so. Nothing less can satisfy the requirements of law and justice. … in the public interest (and not simply to protect the rights of an individual), that there be a “meticulous observation of procedural justice” in such a case. The most important aspect of procedural justice is, as Fennelly J. put it [in McFeely] “In a case where the charge is that he is in breach of a court order, he should be told what the order is and how he is alleged to be in breach. It seems to me axiomatic that these procedures must be observed before the Court makes a finding that the person is in breach of the order”. The nature of this obligation to notify the person whose imprisonment is sought is that “the order allegedly breached should be indicated with absolute clarity and precision in the Motion for Attachment and Committal and the evidence alleged to establish breach of that order should be led in proper form after due and timely service of the motion…”. … the assessment of the conduct of the proceedings in the High Court, and of the appellant’s complaints about them, must proceed on the basis that those proceedings were in the nature of a summary criminal trial conducted by a judge sitting alone. … Summary criminal trials for contempt are not a common form of litigation and when they do arise, they do not often take the form that this one did. That is because, as the reported cases show, the factual issues that arise in practice on an application for attachment and committal are usually very simple. … The present case is of quite a different nature. … imposed an immediate custodial sentence on the appellant not for the purpose of appropriate punishment but for the principle purpose of putting pressure on his father, who was one of the other respondents, to comply with the course of orders which had been made against him. … That is not a legally recognised basis of a just sentence. As between Fennelly and Hardiman JJ, there are important differences both of procedure and of substance. The procedural differences relate to how they regarded the facts as found by Dunne J and the procedures which she followed. The substantive differences relate to their conniptions of the contempt jurisdiction. In the event, the emerging wider view of civil contempt was affirmed by Fennelly J, and that is perhaps the most important issue to take from the judgments. As Judge Hardiman says, the “litigation has been fought on both sides with extraordinary bitterness.” The Supreme Court’s ruling leaves many issues open, and we may expect more of the same as the case continues.